I remember a simpler time in my life, I must have been five or six years old. I would walk about with this camera around my neck. It belonged to my mother, who in a fit of mad generosity had given it off to me. It was love at first sight, I took it everywhere with me! I don’t know which brand it was or what kind of lens it had, but it was a film camera with a slim, steel and black body. It had a view finder that made everything look so much more beautiful, and the lever to click pictures made the perfect ‘click’. The thing was encased in this gorgeous tan leather case. If my memory serves me right, I usually wore a hat when I was clicking – one of the floppy variety – and I’m certain I felt pretty professional in my gear. Alas! There is no picture of me with the camera, so I cannot produce proof. I would potter around the house, garden and terrace peering at quizzical things through my lens. Once I was lucky enough to be able to observe a garden lizard for quite a while…I lay prostrate in the yard, gazing away, comfortable in the knowledge that the camera was there to protect me. Back to the present-ish, I was looking for toys to buy for little Mr. K close to his birthday. We had already decided to get him a balance bike as the big present – he was turning two after all – but I had saved up a little to be able to splurge on his big day. And toddler cameras were a real thing! It made me wonder if that vintage treasure from mum had fostered my shutter love. But whatever was available in the market was either too ‘flashy’ (I abhor light and sound toys) or was for older kiddos. The next best thing was to make one. Thankfully, crafty and inspirational parents out there have shared their DIY tutorials on building cameras ranging from simple to actual working models. I chose to keep it simple given my child’s age and my low level of expertise. I’m a bit obsessed about re-purposing cardboard, so the natural choice for me was to start with a small cardboard box as the base. The shoe box of Mr. K’s first shoes was the perfect size. I then collected other bits and bobs to put together our funky little camera. You could come up with your own version depending on what you can corral together. 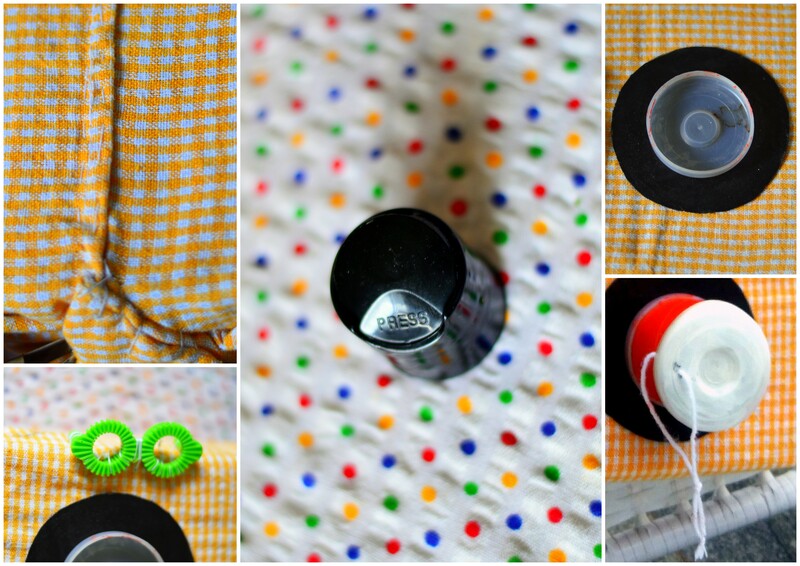 You can create a cute camera with just these supplies. The lens just adds some flair and makes Mr. K feel very important. I also like the fact that it adds a bit more scope for interactive play. Armed with these supplies, I began my project. First, I stuffed the shoe box with some newspaper and bubble wrap to prevent it from collapsing when stress tested by the said toddler. Then I covered it with the kitchen towel and sewed up the edges that gave me a neat, rectangular box to work with. Then I glued on the black circle to the center of the front face of the box using Fevicol. To this, I stuck one of the caps from the water dispenser can to create a holding point for the ‘lens’. 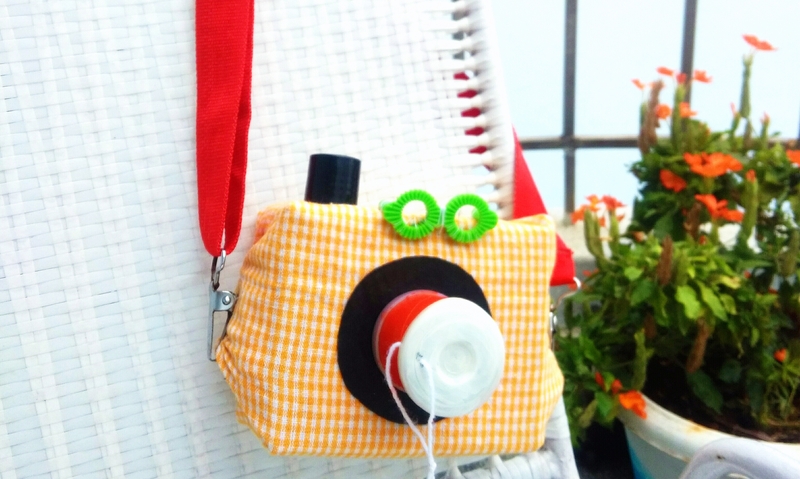 Then, I sewed on the ‘viewfinder’ and stuck the shampoo bottle cap on the top face of the camera. Since the bottle cap was plastic, it refused to be held down by Fevicol…I heated the bottom edge on a candle flame and pressed down firmly to fuse it with the cloth. The pictures below try to capture the key points. Now, on to the lens. Since I was working with a yellow kitchen towel and had found a bright vermilion strap for the camera, I decided to go with a similar colour for the lens. I painted the piece of kitchen towel roll a sunny vermilion and left it to dry for a few minutes. Once it was dry, I pierced a tiny hole near one edge and inserted the bit of string. The second cap of the water dispenser (I painted this white with acrylic paint) became the ‘lens cover’ once I had strung it through and knotted off the tiny bit of string. Ta-da! Our homemade, simply adorable little camera was ready for a test drive. After attaching the strap to the sides, I adjusted the length to fit my bub. It had been a major task fending him off until I had completed the task, so he was thrilled to bits when I finally handed the camera to him. And he went shutter-happy in an instant! I steal it when he’s not looking just to go, “Click, click, click.” Okay, I might be too much in love with it. I hope Mr. K enjoys it for a long time. I am a big fan of gift toppers – ribbons, flowers, bows – bring them on. It’s always wonderful to receive a gift, and seeing that special touch of an embellishment is really nice too. Sometimes you may have so much going on that crafting a fancy topper or making that run to the stationery shop may be out of the question. While looking for quick options to create a bow, I came across this one from the inspiring designer at How about Orange. Since I didn’t have a printer on hand, I decided to use the inspiration to make my own version with sticky notes. These paper bows have come to my rescue often, making that simple gift a wee bit more endearing. And the best part is that they don’t need any elaborate printing or cutting. Just use your trusty sticky notes to give a gift added flair. I’ve used sticky note prompts, but you can make these from pretty much any size or shape of sticky notes. 1. Take one note prompt and create a loop by sticking together the narrow edges. Now repeat with the second note. 2. Slide a pencil into the loop and pinch the glued edges as shown above. Glue the pinched bits to create a gentle crease. Do this for the other loop as well. 3. Stick the two loops to each other by overlapping the pinched edges. 4. Set aside for the joint to dry. 5. Now take the third sticky note and snip off a narrow piece from one end. 6. Wrap it tightly around the pencil to curl it. Hold for a few seconds and unfurl the curly strip. 7. Cover the joint with this sliver of paper; glue the edges to the bow. 8. Hold the paper in place with your fingers until the glue dries. 9. Fold the remaining piece of the third sticky note in half. 10. Snip off a triangle from the open side to create the ends for the bow. 11. Unfold and cut along the crease to get two pieces. Glue each piece to the back of a loop of the bow so that the edge with the ‘V’ sticks out over the loop. 12. Ta-da. Your pretty, chic bow is now ready to adorn your gift. These super quick, easy bows look great on gift boxes, paper bags, books and can even cheer up a brown paper bag. So go ahead and make some right away! How time files! Diwali is already around the corner and I hope you are in better shape than I am. Though my plan is to have a laid back diwali this year (the lazy me came up with the idea) I still want a sprinkling of lights in the festive season. The twinkle of lights and rangoli spell Diwali like nothing else does. Over the past couple of years, I found some lovely ideas on Pinterest to add a few quick touches of warmth to the home. I had shared my finds here on SunnyNomad back in 2012. This time too, there is tons of inspiration to be found and I have been pinning away with glee. If you’d like DIY festive decor but are hard pressed for time to search, fret not. I have pulled together many creative ideas in one place. These are easy to recreate while adding heaps of charm to your home. Yay! Pick from crafts that are snappy five minute fixes to projects that can fill your entire weekend with happy moments of ungluing your fingers. No, you don’t end up doing that? Just me then. I’d love to know which ideas you like best. And do share with us your special way of celebrating the festival of lights. Happy Diwali, may your year be filled with prosperity, love, good health, laughter and adventures! Now that I’m on a break from paid work, I have some mornings when I need to get onto a project for the sake of staying sane. So, I’ve been trying to fix that cursed black thumb of mine…anything I tried to grow promptly died on me in the past. But I am so happy to see that some of my new green friends are positively thriving. To break the jinx, I bought plants from my local nursery and had them potted by their gardener. A couple of palms, a fern, a native bush that has pretty peach blossoms and a lemon tree. As they began to thrive under the care of little K and me I began to dream of bigger things. I was bold enough to bring out two old tubs that had been purchased a couple of years ago with the intention of growing tomatoes. The baby steps I took towards sprinkling some balcony love, have added a lot of happy mornings to our life. K and I spend time watering, pruning, weeding and learning about nature in the early morning sun. What a great activity for a toddler, which also gives him the daily dose of vitamin D.
So to add a touch of whimsy to our morning ritual, I decided to paint a plastic basket before I planted some basil in it. Now, much to my dismay, my wee one is head over heels in love with vehicles of every kind. His love affair began with ‘bus’ and ‘auto’, and now has spun out of control. I’m dismayed because I didn’t want him to be such a boy. I do find some solace in the fact that he loves ‘cooking’ just as much. So to begin with, maybe I should try not to slot him. I’ve been meaning to paint an auto rickshaw for a long, long time. With the renewed burst of optimism from nature, I thought I could do it this time. Or maybe it was just a case of too much sun, if you know what I mean. For over a week the poor basket had sat on my table painted a staid grey on white just crying out for some colour. And against my initial inhibitions against kitsch, I went for it. I used acrylic colours for this planter since they hold up well to rain and sun. The simple joy those couple of hours brought me is something I will hold onto for a while. As K napped, I pencilled in the outline and went to work with the colours. It’s been a few years since I’ve held a brush, so I was thrilled with the final product. My special props assistant did a smashing job as I clicked these pictures. But by the end of his shift, he’d had enough and decided that the only way to stop his mad mum was to make away with the ‘ahtou’. The results are here for you to see. What do you think? Hello! Been a while hasn’t it? It’s good to be back after my long sabbatical from this sunny nook. The sabbatical began as a forced leave due to medical reasons. We were expecting our first offspring, you see. And somehow, I wasn’t ready to share the news until…well, until I had said offspring safely tucked into my arms. But once that happened, my life, it sorta stopped being my life. I was transformed into a 24-hr snack bar and thus began my zombie phase… Being a new parent, it is a job that is difficult to prepare for. I am so grateful to my family for being the most amazing support system in the world. Couldn’t have done the first leg of this journey without them. So, in short, priorities changed (duh!). This blog was my baby until a real baby came along demanding my complete attention. I put on my training floatie and dove into my new role, focussed on bonding with my wee panda. And here I am, a year later, trying to rebuild some semblance of an adult person’s life. My toddler is a fount of joy and life has never been as fulfilling for me. My little man K keeps me busy all day…and when he naps, I read. The blog has been on my mind, I have a couple of unfinished posts sitting as drafts. Somehow, I never hit the ‘publish’ button. After months and months of consuming content – books, articles, blogs, ad campaigns, movies and music – I feel I’m ready to share again. What better way to start than begin at home? We moved two cities in the interim. From Porbandar to Kochi and now to Visakhapatnam aka Vizag. All along this cross-country tour, the sea has been with me. It is the one thing that has instantly soothed away the feeling of being in a new place. I really is a kind of a home for me. Given the choice, I will always want a holiday by the sea, choose to breathe salty air instead of crisp mountain air and would rather buy a tropical island than a log cabin (ahem…once I have the dough, of course I’m buying an island). This is the first time I have lived on the East coast of India…so I’m pretty excited to glimpse the Bay of Bengal everyday from my balcony. This quote I found on Pinterest explains my addiction better than I can. I added it to my favourite click of the morning sea in Porbandar. Perfect inspired creativity for my muse – the Sea. New Zealand – The Happiest Dream Holiday Ever! For the past six months, I have been working on a rather enchanting little project. It involves looking at destinations in gorgeous New Zealand and exploring them from (alas!) my armchair. I trundle through the thicket, swim with the dolphins and indulge in some virtual zig-zagging on pristine snow-capped mountains. And I d-r-e-a-m. I dream of the day when I will finally set foot on kiwi soil. When I first read about Yatra’s Creating Happy Travellers contest on Indiblogger, I realised it may be one of the best chances I’ll ever have to day-dream shamelessly about NZ! Perhaps the very act of writing about my dream holiday will encourage the Universe to set into motion mysterious forces that will make the trip actually happen. I believe in miracles, you see. There are three things that will make this trip the happiest one ever – the place, the people and the experiences. Okay, so dream destination – bewitching New Zealand – check. Next up, travel buddies. My wanderlust has taught me that no holiday can be truly complete without the perfect companions. I have often travelled to far off lands and sighed wishfully, for I wasn’t with the people who I knew would have loved to be there too. Through trial and error I have realised my most compatible co-adventurers are my husband N, my sister Miss P, my Mum and my Dad. Amongst this motley crew I can find a mate to try anything that chance will bring us on our holiday. Mum and Miss P are of course super awesome for shopping. Dad can pick out the most unique spots and vantage points. N can ferret out humour and a live music gig almost anywhere. I can hatch insanely detailed plans and Miss P brings her characteristic dash of eccentricity to make these plans fun. Mum, well she has enough enthusiasm and prudence to propel everyone into making the most of every moment. So all in all a good crew. Very enthusiactic prospects for ‘Creating Happy Travellers’ indeed! Since I’m the maniac who draws up the travel plans, I can promise this will be an overly ambitious list of experiences. Almost always, I do bite off more than I can chew. However, I fancy myself to have matured a bit over the past couple of trips; wizened up to the fact that we may have to leave something off the list. Still, I think being over-prepared with a dream list never hurt anyone. We’ll begin by spending a few days along a stunning coast backed by snow-dusted mountains in Kaikoura. Situated on the Eastern flank on the South Island, Kaikoura is a paradise for whale watching, scuba diving, dolphin spotting, seal meeting and lots of exploring. The natural diversity is as breathtaking as the views from atop the cliffs. And the scrumptious crayfish here gives the sea-side town a well-deserved spot on NZ’s culinary map. Queenstown is called the adventure capital of the world for a reason. It offers you a host of adrenaline pumping activities to enjoy all year round. Take your pick from skiing, snowboarding, white water rafting, bungy jumping, ziplining, swinging, paragliding or skydiving. Phew! Add to that the charm of the Skyline Gondola, a bustling city, immersive Maori cultural experiences and it’s easy to see why Queentown is a hit even with the locals. While the youngsters (ahem! that includes me) may enjoy swinging like monkeys, I’m sure my mum and dad will also be able to enjoy more relaxing activities like cruising on peerless Lake Wakitapu and visiting an authentic high country farm. Otago has many exciting wine experiences in store for the four wine lovers in our troupe. We shall happily explore the boutique wineries and gladly sample some of the best wines in the world. It will be a great way to learn about wine and the local culture, followed by delectable tasting sessions in the cozy comfort of wineries. And mom will be rewarded for her patience with a pampering at a luxurious spa followed by a sumptuous lunch. Yay! Soaking in natural thermal pools till the toes are all wrinkly is like a rite of passage for Kiwi littlies. We won’t be far behind, I say! After all the exploring, binging and adrenaline rush we’ll really look forward to the soothing waters of hot pools that can be found in many parts of New Zealand. NZ is a hot-bed for geothermal activities and you can find some natural, mineral-rich pools dotting the country. The ones in Rotorua, Hanmer and Miranda are most preferred, so we’ll take our pick. I could go on about the many things I’d really like for my dream holiday. New Zealand is so diverse and rich in natural as well as cultural heritage, that the entire trip will be an unmatchable experience. It is a small wonder that the beautiful, bountiful ‘Shire’ of The Lord of the Rings movie is real and in New Zealand. NZ’s adorable ratio of 10 sheep per person, the love for outdoorsy adventure and a penchant for celebrating diversity, culture as well as history makes it such an exciting country to visit. If we do make it to kiwi-land, I’m absolutely sure we will create happy memories and come away more enriched for life. Isn’t that really the best part of travelling? Infectious Creativity: Neil Gaiman Made My Monday! This January I cut loose from my previous life as an account planner with a very important advertising agency, with very important clients and insane deadlines. It’s not that I hated being chained, it just felt like the time had come to swim solo. To give my creative urges an outlet. You know, just hang with the artistic crowd. There are many things that are awesome about this life change. I may have reached a place where I may end up sharing more about the freelancer’s lifestyle/workstyle. But today I want to share the best thing I’ve earned from my decision. I actually enjoy Mondays more than I ever did! I wake up without the fear of being late for work, or staring at an endless job-list (I look at one voluntarily around noon). I sip on my of tea while basking in the company of my lemon tree and stare out at the wind mills in the distance. When I get to my desk (which is actually an ironing board since it adjusts really well with my chair’s height) I look forward to immersing myself in the inspiration that has poured in over the weekend. Today I stumbled onto Neil Gaiman’s 2012 commencement address at the Philadelphia University of Arts. And it is so full of wisdom, so perfect for anyone who’s a freelancer, an artist or aspires to create art, that I had to share it with you. I felt like he was talking to me. Every once in a while, it really helps to know that you’re not the only one who doesn’t know the rules of a game. And it’s even more reassuring when someone so smashingly talented as Neil Gaiman tells you that you’re actually better off without any rules. That way you won’t limit your creativity and what you could ultimately achieve, he suggests. Listen to his speech here. Like, now!